Compost is the best way to improve soil aeration, control weed growth and turn certain garbage into useful compounds. And let us tell you that, compositing is very easy to perform if done correctly. So in order to help you with easy composting, we present you our review on best compost tumblers available in market. 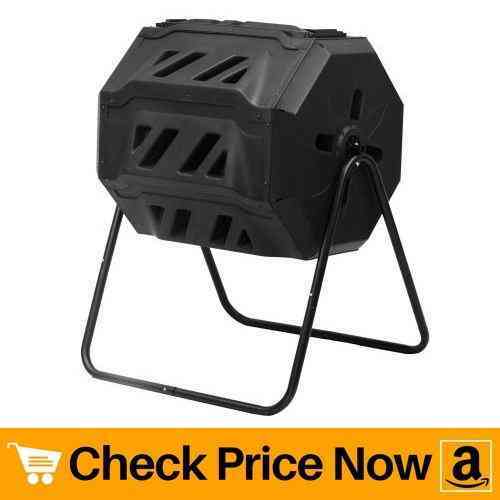 Before beginning compost tumbler reviews let us understand why you should invest in them? First of all, compost is full with nutrients which are necessary for a healthy plant growth. Secondly, it acts as natural soil conditioner. This helps to improve soil aeration and drainage. All of which makes your plants grow healthy and fast. Making use of compost tumblers speeds up the composting process. This is due to its fully sealed design which traps in the heat and decomposes waste fast. Also, this closed design of compost tumblers prevents bad smell from spreading out in the garden. Apart from that, they are usually above the ground which makes it difficult for rodents, raccoons and pets to enter. So what are you waiting for? Go through our best compost tumblers reviews to make composting process at home more fun. 13.1 1. How to use a compost tumbler? 13.2 2. Can you put worms in a compost tumbler? 13.3 3. How often to turn compost tumbler? 13.4 4. How long does compost take in a tumbler? Envirocycle composter is one of the best compost tumbler available in market. It comes with large capacity suitable for regular farmer or people who are into gardening. 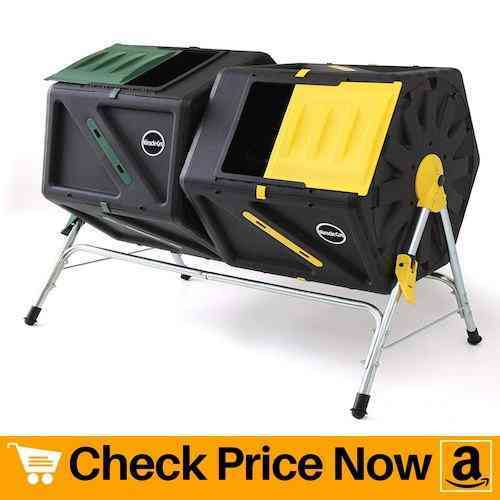 In our this review it perfectly suited the 100 gallon compost tumbler goal. The best part of this deal is that it has dual chambers. Each chamber posses composting capacity of 50 gallons. Add organic waste, garden trimmings, etc without worrying about space. Thus, ideal model for medium to large size gardens. Why we like it so much that we ranked it on number one in our review? It is a Made In USA Compost Tumbler which ensure the quality of the product. It deliver high quality built body and does its job. No cheap plastic has been involved which often damages the final compost composition. If you want a good looking model which suits your garden or backyard, then this unit will not fail you. The two chambers are separate from each other and have a smooth dice-look. Black double-wall panels absorb and retains heat which accelerates formation of compost. Apart from that, it comprises ideal aeration system. This in turn, helps to accelerate decomposing process. 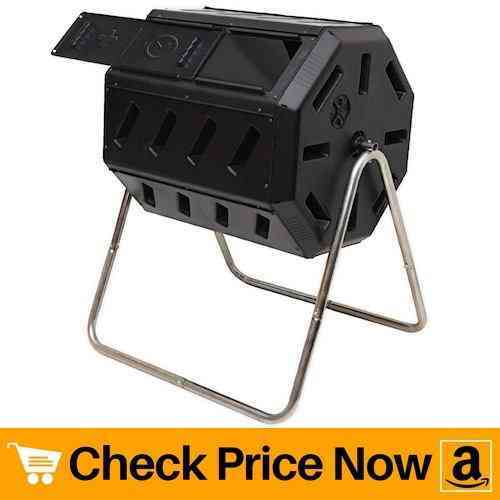 Starting our reviews with lifetime 65 gallon compost tumbler, which is efficient and light in weight. Mixing up the materials inside the tumbler gets easy due to its light-weight design. In addition, the internal aeration bar mixes compost thoroughly and provides air flow. 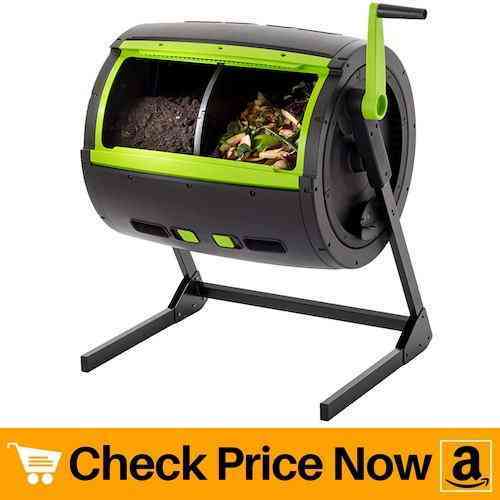 Therefore, making it stand first in our best compost tumbler review list. Speaking of its construction, it is made up using high density polyethylene(HDPE), which is strong and sturdy. Besides that, it is UV-protected and the double-wall panels absorbs and retains heat in order to achieve compost fast. This lifetime compost tumbler comes with an extra large removable lid and a spring-loaded pin that locks rotation while filling the tumbler. This in turn, hold the product in place and makes it convenient to add waste materials. Overall, this is a strong, durable and budget-friendly product which will last for years. It comes only in black color with galvanized steel base. Assembly of the parts is quite easy and you also get a DVD free along with the product. This DVD guides you on how to compost fast at home as well as what waste materials should you throw in the tumbler. Next on our list we have the most famous yimby tumbler composter. Its two composting chambers allows you to add fresh scrap in one section without disturbing decomposing materials. Therefore, which means you can collect the already present compost while adding new waste in different section. This in turn reduces effort and saves time. Its well balanced design makes tumbling easy. You do not need to perform mixing by hands. All you need to do is close the door securely and rotate it as instructed. Apart from that, this unit posses several aeration holes through which oxygen mixes into the organic material. Thus, you get nutritionally rich compost with proper oxygen supply. The BPA-free outer material of this unit is safe to use. Besides that, it is UV-protected which means it will not degrade in hot sunny weather. Plus the steel frame at the base is corrosion resistant. 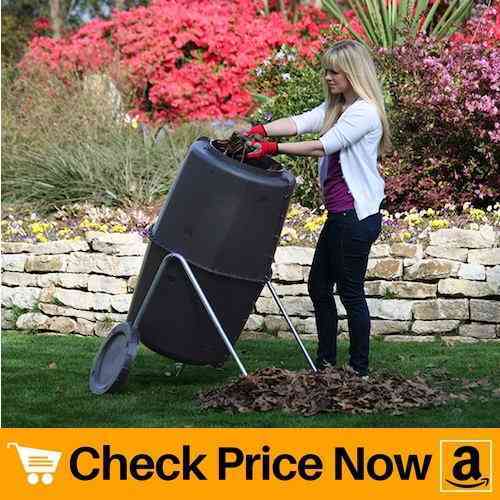 Hence, makes it one of the best compost tumblers under $100. Moving ahead, we have this large compost tumbler with great capacity. 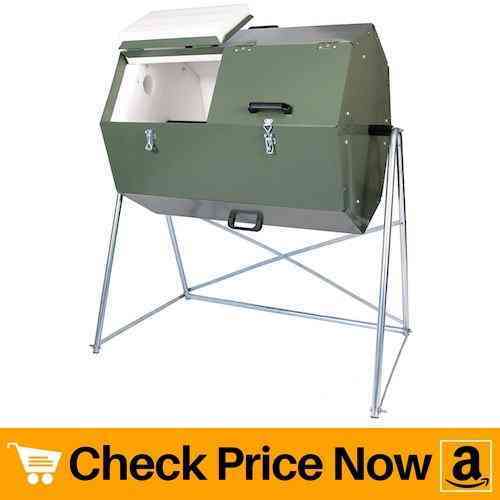 The 70 gallon capacity of this unit makes it suitable for family of 4. One major reason to include it in our best compost tumblers reviews is because of its dual compartments with insulation. Dual chambers allows you to keep adding materials in one bin while other matures. This way you can uninterruptedly collect compost while adding waste material side by side. Thus, it reduces work load and saves time. Apart from that, this insulated chambers helps in decomposing of kitchen waste quickly. Galvanized steel body of the unit makes it strong and sturdy. In addition, these sheets of steel are rust-proof which increases life-span of the product. Plus the design is convenient to use and simple to rotate. Besides that, it is rodent-proof. Thus, makes it best compost tumbler for composting all round the year. This dual chamber compost tumbler does great job at decomposing materials. Its attractive wheel-like design can hold up to 37 gallons of compost. Benefit of such design is, rotating the unit becomes much more easy. Thus, no need to use your hands to dig and mix things up. Another attractive feature that makes this product include in our best compost tumbler list is its excellent aeration. Many aeration holes as well as deep fins helps to break clumps inside the chamber. Also it helps to mix lot of oxygen into the material which makes it healthy and nutritious. UV inhibited, BPA free polyethylene body of this unit is safe to use. Therefore, it will not degrade under sunlight and its performance will stay intact. In addition, the powder coated galvanized steel frame is corrosion resistant. Hence, it will look new for years. This urban compost tumbler provides great efficiency in terms of decomposing. It features dual chambers which makes the unit more convenient for use. To be more specific, the sliding doors measures length of 10.23 inches while width is 6.1 inches. The unit stands stable while spinning it. Also it can withstand winds up to 50-60 mph. All credit goes to its strong steel frame which keeps the device stable. Thus, we can conclude that the product is strong. Capacity of this compost tumbler is enough for a small family. Therefore, you can add eggshells, coffee grinds, banana peel, leaves, etc into the tumbler. This in turn helps to convert maximum kitchen and garden waste into healthy compost. If you’re seeking a best compost tumbler which have descent composting capacity then here is a perfect model. This model from miracle-go posses dual chambers which are separate from each other. Benefit of such design is, you can continuously get compost while you also have room to add new waste. One attractive feature of this unit is, you can remove the doors completely. This in turn helps to easily load and unload materials from the tumbler. Thus, making the device more convenient for use. Ideal aeration system allows good flow of oxygen inside the compost. This eventually makes the compost healthy and nutritious. Apart from that, this compost tumbler is crafted with sturdy side-locking mechanisms along with tight seals to keep rodents away. Seeking a good compost tumbler under budget? Then here we present you a product from good ideas having capacity of 42 gallons. And not to mention, but this much composting capacity is enough to produce good amount of compost if done correctly. Similar to majority of the models, this unit also have two composting chambers. Apart from that, it possess low friction bearing. Thus, helps in easy movement of the tumbler and keeps the device steady. Besides, the model is designed in such a way to keep rodents and insects away. You can choose the perfect model from the three available sizes. Plus the long-lasting materials used in construction of this unit will last for years. In addition, this material absorbs and retains heat which makes decomposing process fast. 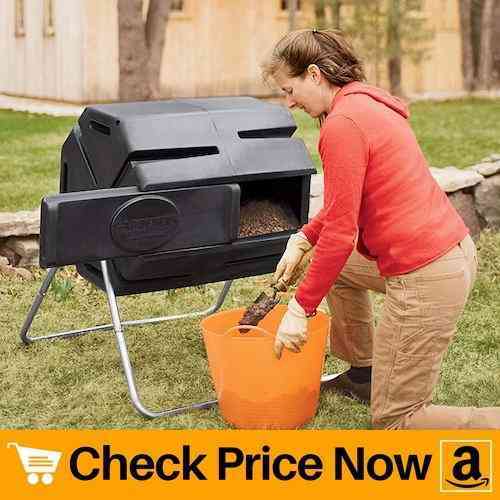 Next on our list we have a unique compost bin tumbler. Design of this model is different from other compost tumblers in our review list. It have large capacity as well is space-saving. Perfect model for those who have small space. Molded in USA, it have 20 ventilation slots, dual mixer bar and 4 compost thermometer ports. All these features contributes in making of healthy and nutritious compost. Also it makes the composting process fast. Thus, making it one the best models with good price. An important thing to note about this product is, manufacturer offers warranty of 2 years. You can ask for full refund or replacement if you encounter any spot in your compost bin tumbler. Hence, which means the product is strong and durable. If loading and unloading materials is a problem due to small doors then this product will definitely solve this issue. This compost tumbler have large sliding doors which helps to fill waste and take out compost easily. In addition, you can slide off doors fully for more convenience. Design of this unit is very simple. And due to its design, it is very simple to assemble the parts and rotate the unit. Capacity of this product is sufficient for use in small to medium size garden. 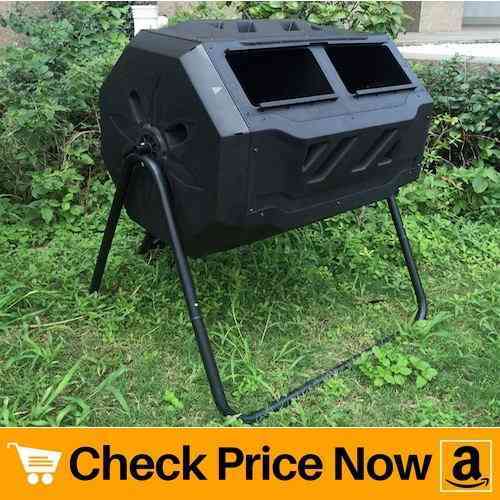 Unlike other cheap compost tumbler, this unit rotates very well without much hassle. Even though when you fill the tumbler up to its capacity, it rotates smoothly. 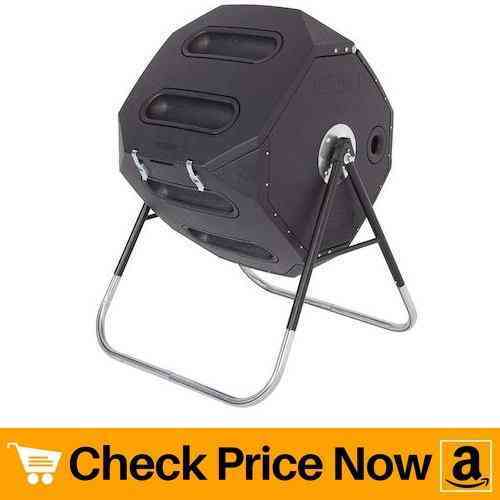 Thus, making it one of the best compost tumbler in our review list. 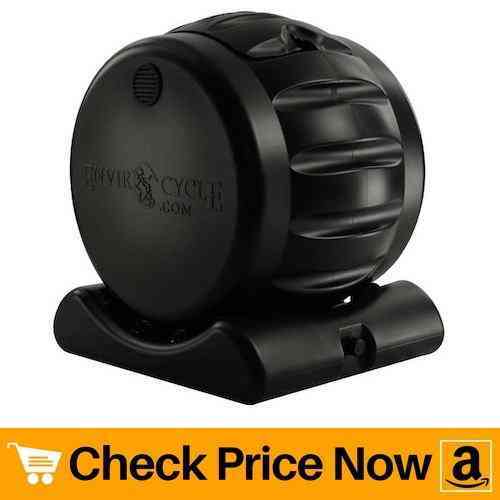 Last on our best compost tumbler reviews, we have a beautiful looking product with great performance. Just like majority of models, this unit also have dual chambers. So what different features makes this product stand in our list? Firstly, it comprises of large clearance area underneath the barrel. This in turn, allows easy unloading of the compost. Secondly, you get a cart free with this unit. The cart makes it easy to collect and carry the compost. Thirdly, handle present on the side of the unit allows easy turning of the composter. Therefore, it also mixes things effectively when the barrel is full. This model is perfect for the areas wherein you get frequent animal visitors. Besides that, the durable framework is rust-resistant. Hence, it will last for years. Now that you know the best compost tumbler list, let us move towards buyers guide. This guide will solve some general question and help to choose perfect model for your backyard/garden. You can also read our review about string trimmers to trim extra grass which can be used to make the compost. 1. How to use a compost tumbler? Most of people buy compost tumbler but improper usage never decompose materials. Thus, the unit then becomes large piece of junk. So below are some tips on how to use a compost tumbler to get healthy compost. Activation: If you’re a first time user, then start with soil, small amount of compost, horse manure or compost activator. These will ensure proper decomposition as well as accelerate composting process. Balance C:N Ratio: Now here C means carbon and N means nitrogen. Materials that are brown in color are rich in carbon whereas green substances have good nitrogen content. And balancing these two components can help to get compost within weeks. Size: Size of materials do matter when it comes to composting. Do shred down waste into small pieces before adding them into tumbler. Filling: Start filling composter in small batches while maintaining the C:N ratio. Once the drum is adequately full, stop adding fresh waste. Now let it rest for some weeks until you get nutritious compost. Also do not forget to spin the materials in between. Moisture: Never add water to your compost until you are living in arid region. Besides that, all the moisture your compost needs is fulfilled by adding fresh kitchen scrapes. 2. Can you put worms in a compost tumbler? Compost tumblers are designed in such a way that they retain heat and help to bake the materials fast. But still if you wish to add worms in your compost tumbler then go for red wigglers. The only reason to choose red wiggler over other worms is, they can resist high temperature. And as we know that the temperature inside the chamber is pretty hot, not most of the worms can survive. Red wigglers also have a serious appetite. Therefore, they can help to break organic materials faster as compared to other worms. Just make sure not to fill your drum with too much of worms. 3. How often to turn compost tumbler? Ideally, you should rotate compost tumbler 4-5 times a week. Also you should add fresh materials once or twice a week and spin the unit after adding it. 4. How long does compost take in a tumbler? Making of compost majorly depends upon the weather conditions. In hot regions, decomposition takes place fast and you get your compost in between 20-30 days. Whereas things are not same during cold and rainy season. During snow or rain, compost becomes wet and soggy and requires more time to break down. Usually, with no compost starter, it takes around 2-3 months to get compost during snowfall or rain. 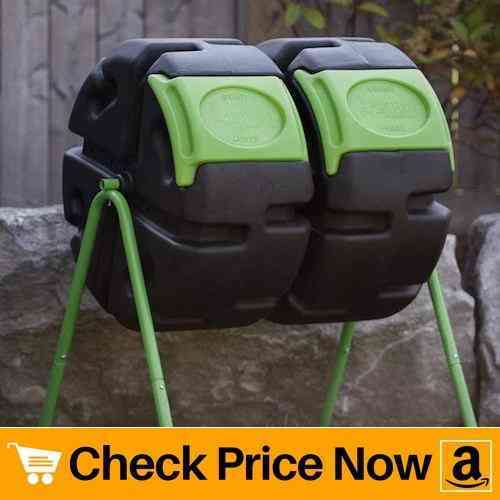 Thank you so much 🙂 really helped get the best composter for my garden.